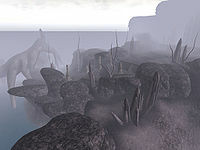 The Fringe is a large, walled area in the west of The Shivering Isles, on the coast of the Emean Sea. 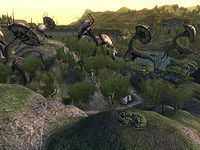 Adventurers entering Sheogorath's realm start in The Fringe, but are not free to explore the Isles at this point, because the only way out is to defeat a gargantuan beast known as The Gatekeeper, or "wait until the blessing of Sheogorath takes root", in other words, go mad. This page was last modified on 19 November 2018, at 04:16.